Roma earned a 1–1 draw in the first leg of their Europa League round of 16 tie against Fiorentina, giving them an away goal advantage that they promptly and spectacularly pissed away at the start of the second leg. Fiorentina opened the scoring with a penalty in the ninth minute. Then it got so much worse when Roma keeper Lukasz Skorupski gifted a Marcos Alonso Fiorentina’s second goal in the 18th minute. 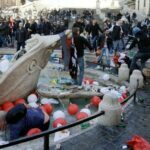 La Viola added a third goal in the 22nd minute and Roma’s supporters in the Curva Sud were so enraged by the shameful display that they called the players mercenaries and refused to even watch until halftime. They did indeed return 10 minutes from the end to stage their protest, hurling abuse at the players and club hierarchy, but largely sparing Coach Rudi Garcia. 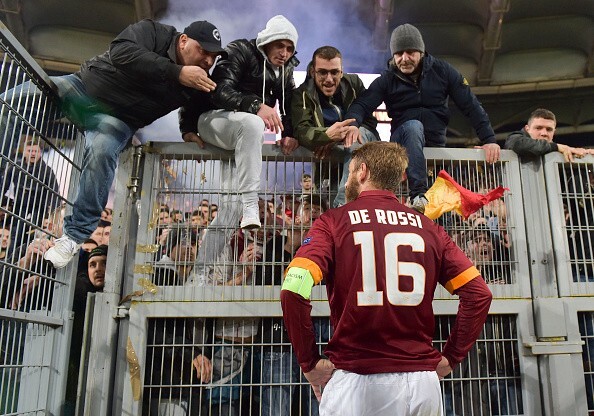 After Roma’s elimination was sealed with a 4–1 aggregate score, the players trudged over to the stands for somber discussions with the angry fans. 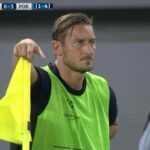 Francesco Totti walked away from these talks looking like a man ready to retire. Roma are still in second place in Serie A, though they are now 14 points behind Juventus after four draws and a loss in their last five matches. Fiorentina also eliminated Roma in the quarterfinals of Coppa Italia this season.